Th Kudu is a compact, yet powerful knife. The 4.25" blade is constructed of German 4116 stainless. This is very easy to re-sharpen although the Cutting edge is already razor sharp allowing it to slice though materials with ease. The blade's locking mechanism is very well constructed and will hold the blade open until you choose otherwise. When you want to close the blade you simply pull the ring on the back spring. The blade is quite strong being reinforced by the 2mm thickness. The handle is crafted using Long Zy-Ex. This is a strong polymer, reinforced by glass. 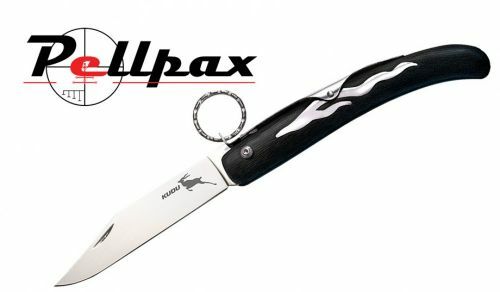 This provides a very comfortable yet grippy surface allowing you to use your knife to its maximum potential. It has a Kudu horn element which has been polished to give it a high grade quality. Overall this knife is excellent value and a real pleasing knife both visually and ergonomically.